The main purposes of pickup trucks should be towing and hauling tasks but many are buying these machines as part of life style as well. For those folks half-tone light-duty versions are certainly adequate solution but those who need true workhorse and supreme towing and hauling capabilities must enter to the heavy-duty league. The first step in this rang are 3/4–tone heavy-duty versions which sit above half-tone light-duty models. Among these trucks excellent pick is Chevy’s Silverado 2500HD but you can also chose between Ford F-250 Super Duty, Nissan Titan XD and Ram 2500. Silverado 2500HD offers great towing and hauling capabilities, refined ride quality, well-built interiors and wide range of equipment customization. It was redesigned for 2015 model year when it got refreshed styling, noticeably improved interiors, new safety equipment and double-cub configuration as well. The next 2016 year has brought upgraded MyLink infotainment interface with Apple Car Play and Android Auto functionality, new trailering package, variable steering system and features like remote tailgate and wireless charging. When it comes to the new 2017 Chevy Silverado 2500HD, it will come with new air-intake system which will be available with diesel powered models. Aside from that things should remain pretty munch unchanged. For the new 2017 Chevy Silverado 2500HD the most important upgrade will be newly designed air-intake system which operates trough new added hood scoop and this system will be equipped on Duramax diesel powered models. New air-supplying system will be providing 60 percent of total air for diesel engine which will be delivered at ambient temperature which is lower than temp under the hood. What is also important, this system will ensure that air will be both dry and cool which is important for better combustion. System has been designed with air-water separator which includes a 180-degree turn which transforms moisture into larger droplets that are then, thanks to the centrifugal force, drained out from the system and engine gets only dry air. This system will provide engine from being heated in harsh conditions and will also improve its efficiency. It will help engine to operate at full capacity in wider conditions range but the engine won’t be able to deliver higher power and torque ratings. 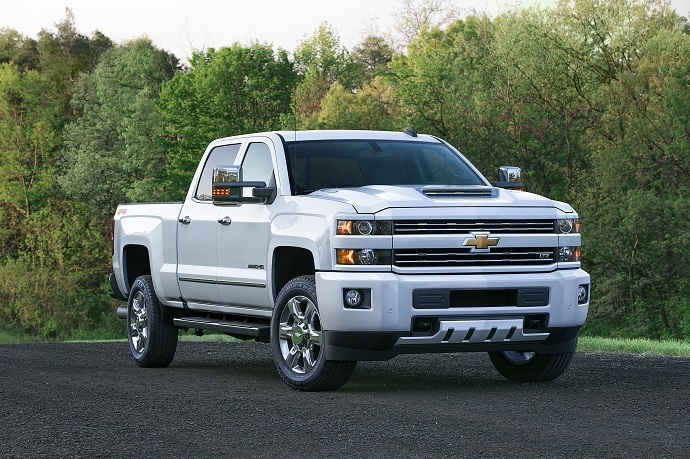 The optional 6.6 liter V-8 Duramax diesel will still produce 397 hp and 765 lb-ft of torque. It will be paired with six-speed Alison 1000 auto transmission. The base engine on the Silverado 2500HD will remain 6.0 liter V-8 gasoline unit that makes 360 hp and 380 pound-feet of torque. This engine can also be driven on CNG but output then drops to 301 hp and 333 lb-ft of twisting. The standard on all models will be rear-wheel drive with option for all-wheel drive. As for towing capability, it should stay around current 18, 000 pounds limit while it will be able to haul up to 3, 540 pounds. In terms of the styling the new 2017 Chevy Silverado 2500HD will mostly continue in similar form from the last redesign except it will be adorned with hood scoop which provides 60 percent of fresh air for Duramax engine equipped models. The rest 40 percent of engine air will come through the intake in front fender. Other parts of the front fascia like grille, headlights, will also continue in the same form as on the current model. The same will be with side body panels which will feature unchanged sculpting with swollen fender flares and bulging lower door area. The rear fascia also receives the same treatment as the current versions. Interiors of the new Silverado HD will also take the same form which has been notably more modern and refined since the 2015 year redesign. The quality of materials will be good on all even base versions while top trims will bring leather upholstery with handsome contrasting accents and stitching. Models will also include large and supportive front seats which will provide comfortable ride. Crew-cab models will also be equally comfortable in rear seating row with enough leg room for passengers. All versions will be available with either 7-inch or 8-inch touch screens. Upgraded MyLink infotainment system will provide intuitive many and plenty of useful features. As every modern and popular ute, the new Silverado 2500HD will be offered in wide range of configurations. Models will be available in regular cab, double and the most comfortable crew cab formation. Regular cab versions will come with 8-feet log bed only. Two other cab options will be available with either standard 6.5 feet beds or an optional long bed. When it is about available equipment, the company is expected to offer the same grouping strategy. That means that this heavy-duty model will offer the basic WT, LT, LTZ and top of the line High Country trims. The base Work Truck trim will include 17-inch steel wheels, chrome bumpers, vinyl upholstery, up to six speakers, an optional 7-inch MyLink infotainment system, power door locks, etc. The MyLink system includes OnStar with 4G LTE WiFi hotspot, satellite radio, voice controls, Apple Car Play and Android Auto compatibility. The LT model will be available with an 8-inch screen, cloth upholstery, 17-inch alloy wheels, remote keyless entry, leather-covered steering wheel, carpeting and so on. On the LTZ trim will be added features like dual-zone auto climate control, leather upholstery, tilt and telescoping steering wheel, heated front seats with eight-way power functionality and driver memory setting, and so on. Top trimmed High Country models will add chrome side steps, a navigation system, premium leather upholstery, heated and ventilated front seats, premium Bose sound system, etc. There will also be off-road Z71 package which includes underbody protection, special suspension, unique wheels, and so on. For the safety purposes, all models will have anti-lock brakes, stability and traction control, airbags, and OnStar notification system. Optional or standard on higher trims will be rearview camera, parking sensors, forward collision alert and lane departure warning. The new 2017 Chevy Silverado 2500HD will be available at dealerships this fall. Precise and full pricing and specs will be known closer to release date. However, price won’t change much compared to the current price range.